How the hell did this ever get on network TV? I’ve argued before that there are hardly any interesting shows on the broadcast networks anymore; everything is so safe and watered down and sanitized, for the general masses. So how in the name of John Phillip Sousa did a show about a high school glee club and their oddball teacher get on Fox? 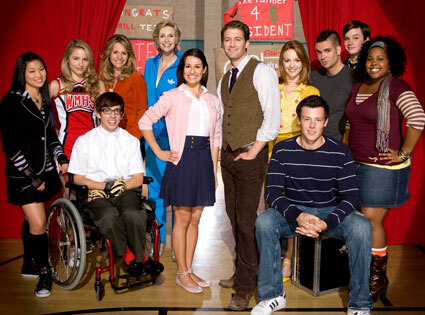 “Glee” is awesome. It’s subversive and funny and sarcastic and possibly brilliant, though after only three episodes I’m a little hesitant to call it brilliant. If you haven’t seen it, the first three episodes are on Hulu.com linked here, and I highly recommend it. Basically, it’s about a very-low-on-the-coolness-totem-pole high school glee club, and their struggle to gain acceptance and deal with each other. There’s Rachel, the way overachieving lead female singer, who reminds me a little of Tracy Flick from “Election.” Rachel’s got a crush on the best guy singer, Finn, who happens to also be the football quarterback but really, he just wants to sing Journey. There’s also a loud African-American in the glee club, a kid in a wheelchair (who sadly gets locked in a port a potty in one episode; I told you it was a little subversive), and a teacher, Mr. Schuster, who was once a glee club star and yearns to see the McKinley High group reach its past glory. Of course, there are problems, starting with the hilarious Jane Lynch (she was Steve Carell’s boss in “40-year-old Virgin.”) She’s the coach of the “Cheerios,” the cheerleading squad at the school, and of course she hates Glee. There’s also Quinn, the cute blonde cheerleader who’s the president of the Chastity Club at the school (also Finn’s girlfriend; now do you see why he’s frustrated and needs to sing?). I won’t give away anything except to say that the pilot was supremely awesome, and the next two episodes have been great, too. I’m reluctant to give my heart to this show because most brilliant stuff on TV gets cancelled; America can’t handle intelligent programming, sadly. So even though I’m sure “Glee” will be cancelled within a year, I say definitely check it out. And oh yeah, the kid in the wheelchair makes it out of the port-o-potty OK. Just didn’t want you to worry. **I’m getting frighteningly confident about the Jets this weekend. I know they’ll just break my heart, but it’s Patriots week, so I’m even more fired up than usual. **Tim Stauffer update: My old friend from Saratoga Springs continues to pitch well for the Padres; he took a loss Friday night but his ERA is still 3.51, pretty damn good for a pitcher these days. Great to see Tim doing so well. Email, and ye shall receive an answer. That’s my credo for today. So after my rant yesterday about how mad I am that the YES Network, which televises Yankees and New Jersey Nets games, won’t show the games on their YES national channel, which I get living down here in Central Florida, I figured I’d ask a few experts if there was a good explanation about it. 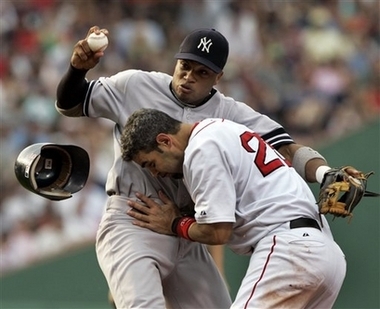 I was particularly incensed because the Yankees are in the midst of kicking the holy hell out of those Boston boys this weekend. So I emailed Richard Sandomir, the fine sports media and business writer for the New York Times on Sunday morning, asking if he knew the reasoning behind the YES Network games blackout outside of the tri-state area. I figured, since it was a Sunday afternoon and all, and he’s probably a pretty busy guy, that I’d hear back from him in a couple of days. I say “stunningly” because while I do my best to answer every reasonable email I get, I’ve found most other journalists don’t. But Richard’s clearly a good guy. Richard’s explanation goes like this: Major League Baseball sets out exclusive territories for each team, which for the Yankees is the tri-state area, and a little bit of Pennsylvania. Beyond that, MLB doesn’t let teams show their games on basic cable, because they’re afraid it would severely damage that other hometown teams ratings. So, theoretically, if Yankees games were allowed to be shown here in Florida, Marlins and Rays games would see a big ratings drop, because all the New Yawkers living down here would watch the Bronx Bombers instead. The only way to 100 percent guarantee that you’ll see all the games you want is to shell out a few hundred bucks for the MLB Extra Innings pay-per-view package. OK, a few thoughts. First, I understand MLB’s position, but by blacking out the Yankees, they’re assuming that baseball fans are baseball fans, and that if we can’t see the Yanks we’ll watch the Marlins or Rays. I don’t think that’s accurate. If you’re that diehard of a fan, you’ll buy the Extra Innings package. I’m not going to suddenly become a huge Evan Longoria fan because he’s on my TV every night. Second, why even have the YES Network nationally as an option if you’re not going to be able to show the programming? I just feel like it’s a big tease. Anyway, so there you go. I apologize for assuming this was all YES Network’s fault, when I should have realized that the blame truly lay with MLB. I absolutely hate it when bloggers rip and rant one day, then, when it turns out they’re wrong or there’s an explanation, never own up and apologize. Michael Sokolove has written a feature for the New York Times magazine about the dying newspapers in Philadelphia. Obviously this hits home to me as an ink-stained wretch, but this really lays out the Philly issues well. Finally, very interesting story by George Dohrmann in Sports Illustrated last week about just how much paper college football and basketball coaches waste, sending old-fashioned letters to recruits. Truly staggering, and wildly ineffective. Wait till you see the photo of how much mail just ONE kid got.